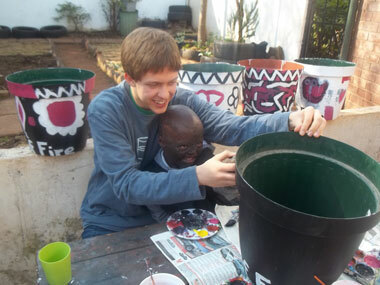 Jacques van Rhyn (17) is an enthusiastic teenage volunteer who helps with anything that is needed at the charity. That can be painting with Nelson (8) as seen here, or researching on African diseases, or preparing tactile teaching aids for the blind children. Why youths like Jacques make a difference is because they turn up regularly, on time, are honest, hard working, respectful and full of initiative and enthusiasm. Jacques has helped people who've been left destitute by fires. He's taught at the squatter camp literacy scheme. He's accompanied children on hospital visits. Jacques has taught children how to swim. And he's qualified in First Aid. We are lucky to have him as part of our team.